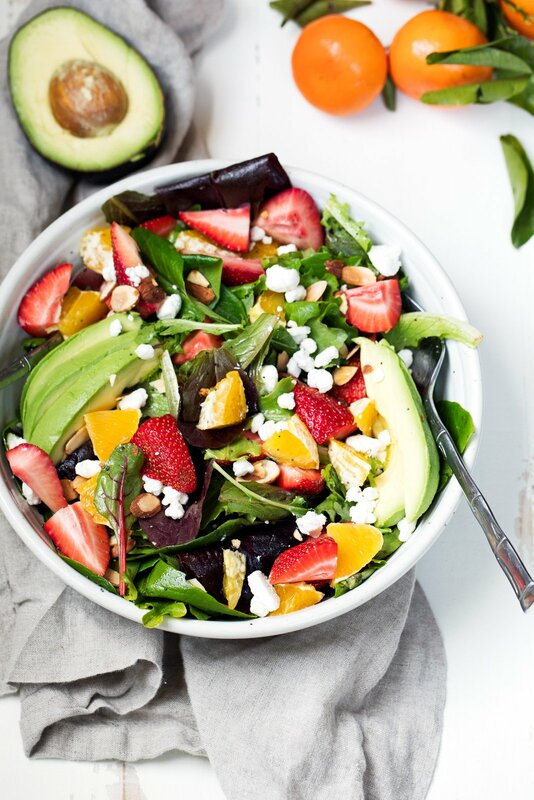 Strawberry Avocado Salad packed with heart-healthy fats, creamy goat cheese, toasted almonds and a light citrus poppyseed dressing. Like Panera’s salad — but so much better! I’m headed home from a lovely trip to Arizona and the warm(er) weather. Tony and I had such a wonderful time in majestic Sedona — from the incredible hiking up to Devil’s Canyon to the midnight star gazing, it was everything we wanted. Thank you for all of your recommendations, I so appreciated them. Every time I get back from traveling for awhile, I crave vibrant fruits and veggies to fill my plate. Because let’s face the facts: there’s always a 100% chance that my belly’s been full of a few too many carbs and on-the-go snacks that aren’t always the best choice (helloooooo fro yo topped with frosted animal crackers!). One of my goals for the blog this year is to diversify my content and bring you more plant based meals that are easy, but still creative and 100% deliciously healthy. So today I’d like you to meet this gorgeous Strawberry Avocado Salad. You might just become the best of friends. 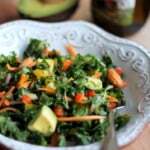 This salad is one that I find myself making again and again. It’s simple, yet bright and elegant enough to serve at a party or Spring/Summer BBQ. 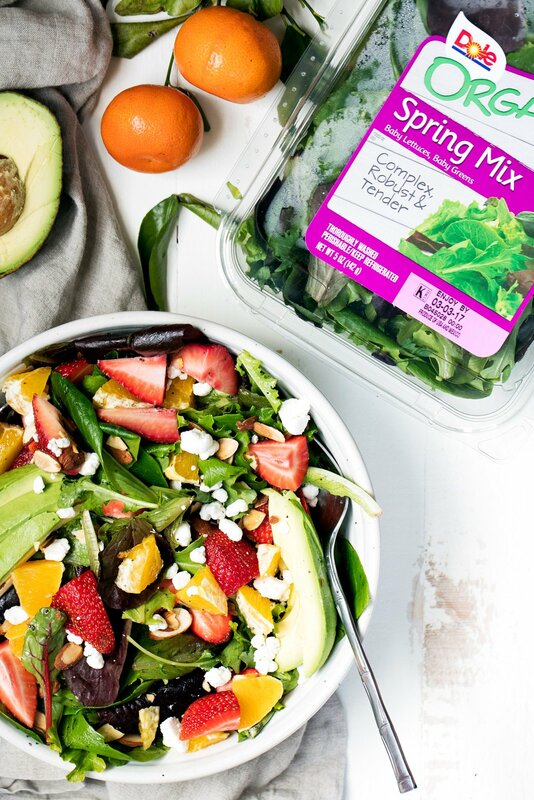 All you have to do is pick up a package of Dole’s Organic Spring Mix plus a few other seasonal fruits and you’re all set for salad success. Dole’s Organic Spring mix is made with a blend of baby lettuce and baby greens — so it’s basically become my go to salad mix. Now let’s talk salad specifics! 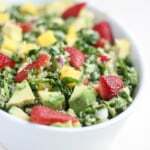 This salad is bursting with juicy spring flavors like vitamin C packed strawberries and potassium loaded creamy avocado. It reminds me of a fresh take on Panera’s Strawberry Poppyseed Salad, except this one is made with real oranges instead of the canned mandarin ones that are soaked in syrup. We’re all about fresh flavors around here. Oh and the citrus dressing? Well it’s basically just the bee’s knees: a fresh poppyseed dressing that’s both vibrant and flavorful beyond belief. 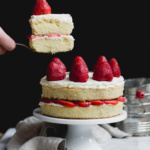 It’s fabulous, light and brings out the flavor of the fruit in every bite. To finish off the salad, I’ve added toasted almonds and creamy, tangy goat cheese. There’s no resisting this bowl of goodness once you’ve tried it. If you haven’t gotten a chance to try Dole’s Organic mixes, I highly recommend it. They have a few different varieties in stores, including salad kits! 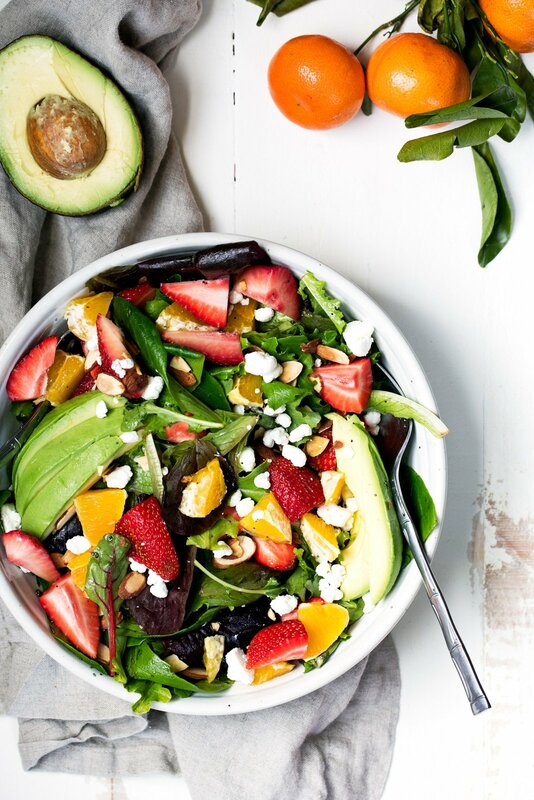 Gorgeous Strawberry Avocado Salad packed with heart-healthy fats, creamy goat cheese, toasted almonds and a light citrus poppyseed dressing. Like Panera's salad -- but so much better! First make the dressing: Add the orange juice, oil, apple cider vinegar, honey, garlic, dijon mustard, poppyseed and salt to a medium bowl and whisk until well combined. Set aside. Add sliced almonds to a skillet or pan and place over medium heat. Toast almonds for 5-7 minutes or until almonds become golden and fragrant. Be sure to stir every minute or so to ensure that almonds do not burn. Once they are finished toasting, immediately remove almonds from the pan and set aside to cool for a few minutes. 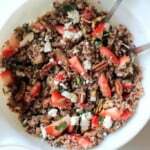 In a large bowl, add spring mix, quartered strawberries and orange segments. Then pour dressing over and toss to combine. Top salad with goat cheese crumbles, avocado and toasted almonds. Serve with protein of choice, or as a side salad. Enjoy! Serves 2-4 depending on how hungry you are. Nutrition info is for 4 servings. 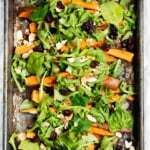 I recommend adding salmon or grilled chicken to this salad to boost the protein for a full meal. 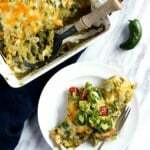 This recipe is in partnership with Dole Fresh Vegetables. All recipes, text and opinions are my own. Thanks for supporting Ambitious Kitchen and the brands that help make this site possible! 5-Ingredient Grain Free Maple Peanut Butter Cookies Weekend Favorites: And we have a wedding date! 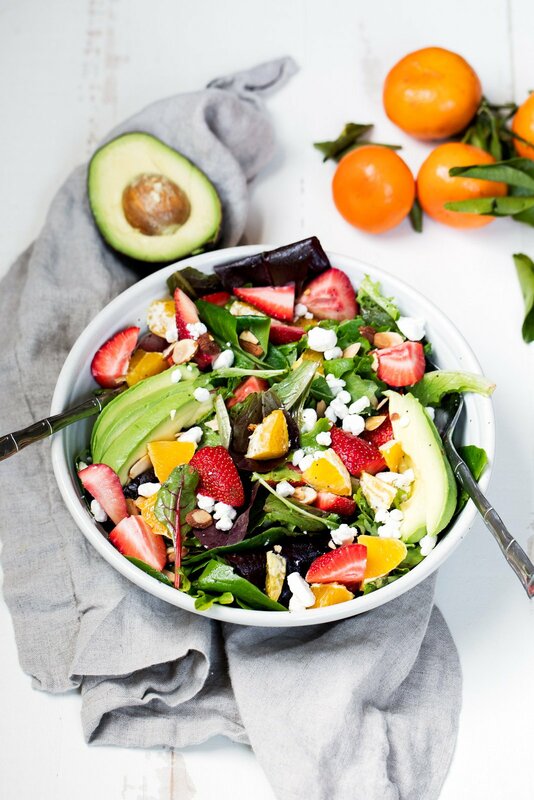 21 Responses to "Orange Strawberry Avocado Salad with Citrus Poppyseed Dressing"
This looks so stinking good! Adding this to my meal plan next week! the only poppyseed dressing i’m familiar with is that super creamy storebought one with a peach on the front. 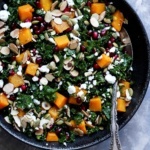 this one sounds delicious too, and perfect when i want something a bit lighter and fresher. It looks beautiful, but am I the only one who can’t do citrus fruits in a salad? They don’t feel crisp enough to me or maybe it’s firmness or maybe it’s the strings…..I don’t know. Any thoughts on what to sub? Gorgeous colors, amazing flavors, AND packed with tons of nutrients? I’m in! This looks like a delicious and healthy salad. Gotta try it. Made this for dinner tonight, it was SO good. The only change I made was that I added some grilled chicken. I will definitely be adding this into my dinner rotation. Summer can’t come soon enough… thanks for this recipe!